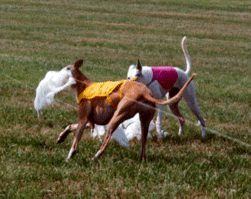 Lure coursing is a field sport which simulates the ancient sighthound sport of coursing — the chase of the hare by the pursuing hound. The “hare” consists of strips of white plastic attached to a continuous loop or drag line that runs through a series of pulleys to simulate the zigzag path of a rabbit on the run. No wagering is involved; the dogs run for fun and the occasional ribbon or trophy. 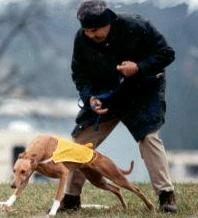 Lure coursing is not merely a race. Greyhounds and the other participating sighthound breeds are judged not only on speed, but also on enthusiasm during the course, agility in making turns, how accurately they follow the path of the lure, and their endurance in completing the course. This article is intended to provide step-by-step suggestions for getting your Greyhound started in lure coursing in a way that will help you avoid some of the pitfalls common to lure coursing newcomers who “leap right in” without adequate preparation. It is not intended to be an exhaustive treatise on lure coursing. It is based on my own experience in lure coursing, numerous discussions with lure coursing veterans whose experience goes back many more years than my own, and the experiences of a number of Greyhound owners whom I have had the pleasure of mentoring in their “rookie year. There is most assuredly a right way and a wrong way to get started in lure coursing with a Greyhound. The right way: do your homework, get your Greyhound fit, and take it slowly. The wrong way: with no preparation, take your soft “couch potato” out and throw him into competition his first time out. The “wrong way” scenario typically goes like this: the new adopter hears about lure coursing, and decides to take his Greyhound to a practice or a field trial. He figures that since his retired racer runs in the back yard, he’s ready for the lure coursing field. At the field trial, some veteran coursers try to give him unsolicited advice, he feels they’re talking down to him, and he ignores them. He runs the Greyhound, who has never seen lure coursing and is entirely unfamiliar with the movements the lure makes. The dog tries to take a turn at too high a speed, gets hurt, and the now surprised adopter is upset. He blames the sport of lure coursing, the host club, or the veteran coursers whose advice he chose to ignore, when it was his own lack of preparation that got the Greyhound hurt. Don’t let this happen to you and your Greyhound! First, a word about injury potential is in order. As with any athletic activity, lure coursing does hold some risk of injury to your Greyhound. It involves all-out running that is both more intense and more exhilarating than any free running your Greyhound will do in the backyard. Letting your Greyhound try lure coursing is analogous to letting your child participate in youth sports. The fun comes with both risk and responsibility. It is your responsibility to know your dog’s fitness level and to be attentive to his condition before and after he runs. To put the injury risk in perspective, a Greyhound free running in your back yard also runs the risk of injury, and if your yard has trees, rocks, holes, stumps, etc., the injury potential there may be greater than on the more controlled environment of a flat or gently rolling pasture that has been converted to a lure coursing field. Although you can’t completely eliminate all risk of injury (in lure coursing or any other sporting endeavor), following the suggestions below can certainly help reduce that risk. If you think you might be interested in taking your Greyhound lure coursing, start by doing a little background research on him. Jot down his ear tattoo numbers, then call the National Greyhound Association or e-mail the NGA and ask them to give you your Greyhound’s registered name, his certificate number and his volume number. (You will need this information later to get your Greyhound certified to participate in field trials.) Also ask the NGA folks to give you the name, address and telephone number of your dog’s registered (former) owner. What was your Greyhound’s racing weight? Did your dog sustain any racing or other injuries during its career? If so, what were they? Was your Greyhound ever “ticketed” for interference or fighting? If the former owner was not personally involved with the Greyhound, he may not have the information you request. If that’s the case, ask him to give you the name and phone number of the racing kennel to which he leased the dog and the name of the trainer. Call the trainer and ask the above questions. If you are not able to read the tattoo numbers, or if the NGA doesn’t have the requested information, don’t despair. You can still enter your Greyhound in lure coursing trials using an Indefinite Listing Privilege (ILP) number obtainable from the American Kennel Club. To get an ILP number, call the AKC at 919-233-9767 and ask them to send you an ILP application. You can also download the form from the AKC Web site at www.akc.org/pdfs/ilpform.pdf. The application form is quite self-explanatory. Any injury history you learn about your Greyhound from its former owner or trainer should be discussed with your veterinarian. If you are unable to find out anything about your dog’s history, a trip to the vet for a thorough physical examination is a good idea. Discuss your lure coursing plans with the vet, and ask him to determine whether your Greyhound has any musculoskeletal, cardiac, or pulmonary problems that make full-speed running inadvisable. While you’re at the vet’s office, weigh your Greyhound. Ideal lure coursing weight is no more than 5 pounds over racing weight. If you are unable to determine your dog’s racing weight, take a good (and honest) look at him – you should be able to see the outline of at least the last two ribs. If you haven’t been able to resist the urge to “fatten up that skinny Greyhound,” it’s time to put your friend on a diet and get that weight off! 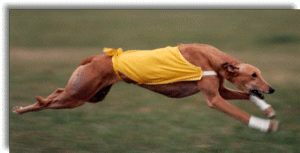 Running an overweight Greyhound (either at lure coursing or at play) puts undue strain on joints and muscles, and can cause injuries. Maintaining proper running weight will help make your Greyhound healthier and longer-lived, whether you go lure coursing or not. Next, take a look at those toenails. Overlong nails are the primary cause of toe injuries in the lure coursing Greyhound. Your Greyhound’s nails should be kept trimmed short enough so that they don’t touch the floor when the dog is standing on a hard surface. If you’re timid about trimming nails, take your dog to a groomer for a pedicure. To avoid the risk of soreness or infection, don’t trim nails within three or four days of a lure coursing run. With your Greyhound at or near his ideal weight and his nails trimmed, you’re ready to assess the state of his conditioning. How much running–to the point of reaching that fully extended double suspension gallop – does he do each week? If the answer is less than two or three times per week, some additional conditioning is advisable. Ideally, conditioning should take the form of roadwork alongside a country road, running on lead behind a bicycle or vehicle. But let’s face it – that’s unrealistic for the majority of Greyhound owners living in an urban or suburban environment. If your own residence doesn’t have suitable running space, take your Greyhound to a fenced athletic field, a park, or a friend’s yard and throw a ball or Frisbee (or whatever else he’ll chase), starting with ten to fifteen minute sessions and building up to twenty-five to thirty minute sessions. Take frequent breaks to let the dog’s breathing slow down, and so that the dog won’t get bored with the chase play. While your Greyhound is getting in shape, take him to a practice or a field trial and let him watch. Former racers, by virtue of their track training and racing career, are used to chasing a lure that does not make sharp turns, and consequently they may not be accustomed to slowing down enough before they make a turn. Taking a turn at full speed may be asking more of a toe joint or foot bone than it was designed to take. I have become convinced that by our letting them watch, former racers can learn that the movement of the lure is not like the lure on a track, and they will go onto the lure coursing field better prepared for the game. Let your Greyhound watch at least one field trial, both the preliminary and the final runs of Greyhounds. Letting him watch at a second field trial is even better. You can have him watch the runs of other breeds, but make sure you get him out of sight of the lure for periods of rest at a field trial, as you do not want him excited and barking at the lure all day. Once your Greyhound has watched, and is in shape to run, it’s time to run him alone, either in the Singles stake of the regular trial or in practice at the conclusion of the trial. To find out about lure coursing trials in your area, go to the National Lure Coursing Club’s Web site at www.nationalcoursing.com or the American Sighthound Field Association’s (ASFA) Web site at www.asfa.org, or ask your adoption group to refer you to a local lure coursing club or an adopter who has become active in lure coursing. Letting your Greyhound run alone enables the lure operator to run the lure just for him and to give the lure long leads so that your hound won’t be “surprised” by a sudden quick turn of the lure and try to take that turn at top speed. Always tell the lure operator that you are practicing a new Greyhound, and ask him to keep the lure well ahead of the dog. For those runs alone, I prefer the Singles stake over practice. In the Singles stake, your Greyhound will run alone twice during the trial, will be scored by the judges, and will be eligible to win ribbons, but cannot run with other dogs for Best of Breed or Best in Field. Some contend that the Singles stake is “just expensive practice” because the typical entry fee for Singles is $15 as opposed to the usual $2 to $5 that most clubs charge for practice, but I disagree entirely. Running your Greyhound in the Singles stake will assure him two runs, as opposed to the one practice run at the end of the day, when many hounds may be waiting to run while daylight is fleeting. It will also help you get accustomed to knowing when and how to get your Greyhound ready for his course and to understanding the information on score sheets. When you have selected the field trial you want to attend to let your Greyhound watch, try to commit the day so that you can see roll call, inspection, and the preliminary and final runs. What to bring to that first field trial? At a minimum, a folding chair for yourself, and drinking water and a water bowl for the Greyhound. If you have a crate and can get it in your vehicle, bring it – it’s a great place for your Greyhound to rest and relax out of sight of the lure, and that will be a nice break for you as well. (Don’t leave a Greyhound unattended and uncrated in a vehicle even at a cool weather field trial – the damage a lure-excited Greyhound can inflict on the interior of a car is a wonder to behold!) In warm weather, it’s a good idea to bring your own shade in the form of an inexpensive picnic canopy, as some fields have limited shade. If your Greyhound has its dew claws (the nails about a third of the way up the foreleg), go to a pet supply store and buy some “Vetrap.” This is a bandaging material that is excellent for covering the dewclaws to keep them from getting caught in the lure line. It can also provide some minimal protection of the legs from cuts or abrasions by the line if continuous loop lure (as opposed to drag lure) is used by your local club. Before your Greyhound runs his first course, ask a lure coursing veteran at the trial to show you how to wrap the dewclaws. The wrapping should be done shortly before the run, and cut off shortly after. Your Greyhound should be fed about one half or less of his normal morning ration early on the morning of a lure coursing event to avoid the risk of gastric torsion, commonly known as “bloat.” He should not be fed for several hours after his runs. When it’s time for your Greyhound’s first run, ask this lure coursing veteran to get you set up with a sliplead (lure coursing clubs usually have “loaner” slipleads and lure coursing blankets), and to show you how to use it. Also, ask him to explain release and retrieval procedures. When the lure is moving during the other dogs’ runs, make sure that you have a good hold on your Greyhound – don’t let him out the full length of the lead, as a lure-excited Greyhound can most assuredly back out of even a martingale collar at that distance. If he does get away from you during a run, call out “Loose dog! !” in a loud voice to alert the lure operator that he should stop the lure to avoid a mid-field collision. By tradition, most clubs impose a $5 fine on the owner of a loose hound, but the embarrassment is always worse than the fine! After the run, take the dog for a cool down walk for ten to fifteen minutes. This will help prevent muscle cramping and will give you a chance to observe any change of gait and do a “once over” inspection of feet and legs. If it’s a warm day, wet the Greyhound down, particularly the chest, inner thighs, and feet. (It’s also a good idea to wet him down before the run.) Wait until his breathing has slowed down somewhat before allowing him to drink water, and make sure he has plenty of fresh water thereafter. Cut the wraps off his legs. If you and your Greyhound have enjoyed lure coursing so far, you’re ready to get him certified to run with other Greyhounds in regular field trials. “Certification” means that a licensed lure coursing judge has watched him run with another Greyhound over a course of at least 500 yards, and that he both completed the course and did not interfere with the other dog. If the former owner or trainer of your Greyhound told you that he was “ticketed” for interference at the track, don’t give up on ever lure coursing him – that doesn’t necessarily mean that he will interfere on the lure coursing field. However, it would be a wise precaution in such a case to put a racing muzzle on him before he runs with another dog, just to make sure that no nipping takes place. If your Greyhound successfully completes his certification run, the judge will sign your “Hound Certificate” form provided to you by the host club. On the form should be written your dog’s registered (“racing”) name and NGA certificate and volume numbers. Keep the Hound Certificate among your Greyhound’s other records. When you enter him in the Open stake in his first regular field trial, you must attach a copy of the Hound Certificate to the entry form, keeping the original for your records. If your Greyhound doesn’t get certified the first time, don’t give up. Continue running him alone for a few more field trials in Singles or in practice – many Greyhounds learn through repetitive practice to concentrate on the lure, and not on chasing their running mates. If he continues to interfere, continue to enter him in the Singles stake. I have one Greyhound who ran most of her career in the Singles stake, and we enjoyed lure coursing together just as much as the Greyhounds running with competition. I hope this article has given you a realistic perspective on what it takes to properly involve your Greyhound in the sport of lure coursing, but hasn’t scared you off. If your Greyhound is an appropriate candidate for the sport and you are willing to make the investment of time and interest in preparing him, lure coursing can be a wonderful bonding experience with your Greyhound, and there is no doubt that both hound and human will enjoy themselves immensely. Have a safe, fun, and exciting lure coursing experience. Tally ho! John Parker is Chairman of the Advisory Board of Greyhound Pets of America-Atlanta/Southeastern Greyhound Adoption, and is president of the Southeastern Greyhound Club. He is a member of the National Lure Coursing Club, the Apalachee Coursing Club and serves on the Board of the Coursing Hound Association of the Southeast. He lives with his wife Laura and their 10 Greyhounds, 2 Whippets and 5 horses on their farm near Newnan, Georgia. Great article! I just want to add a couple things- many of the Greyhounds who were fosterd before adoption have been traine NOT to chase things – especially small things that are fast and zigzag a lot. Your greyhound may be reluctnat to chae the plastic bag. If so, I recommend the “go get it!” chase game. Buy a horse training whip – available at most feed stores or online. Tie a white plastic bag to the end of the whip. Drag the plastic bag on the gorund and urge your Greyhound to chase it, lavishly praising him/her for any interest. You can snap the whip to give some “life” to the plastic. Also, in Greyhound racing the “bunny” is elevated. Some hounds have never seen “prey” running on the ground. Using the whip/plastic beg introduces them to this concept.